Seabed preparation and scour protection on a met-mast in France. Maintenance dredging for ferry berth and harbour approches. The soft material were transportet out to sea at a distance of 2Nm and dumped at the approved deposite site. Also included multibeam survey work. Installation of 4 classes of stones in embankments up to 6 meter to improve the geotechnical stability of the main rail bridge between Copenhagen and Jutland. We also did daily multibeam survey to monitor the progress and quality. Works was carried out in high current, deep water and dense traffic. Construction of jacking spots in the harbour of Esbjerg to be used during loading of installation vessels. Work comprising of dredging, stone placment and survey and documentation. Delivery and installation of sand on top a wreck 'Lindormen' which sank during the Battle of Fehmarn (1644). The sand was placed as protection during the upcomming construction of the Fehmarnbelt tunnel. Also incl. in., interim- & out- surveys. Capital dredge and installation of rock armour stones alongside new quay. Maintenance dredging of 3 harbours and approach channels in two summers. Dredging of a marina hereunder transporting 5Nm to dumpsite. Dredging of contaminated material from a busy coal terminal. All materials where carefully dredged environmental grab and placed directly into lorries and transported away for further treatment. Removal of boulders up to 12 tonnes from turbine positions and cable routes prior to installation. Water depths range approx 23-44 meters. Multibeam survey of a area approx 50x50 meters to establish the relative position inbetween 6 piles on a offshore converter station – accuracy in x,y better than +/- 5cm. Placeing of scour protection in a ferry berth. Stones were transported 5 Nm inwards on the very busy Göta Canal entering Göteborg. Removal of boulders up to 12 tonnes from turbine positions and cable routes prior to installation. Water depths range approx 12-22 meters. Removal of boulders up to 12 tonnes from predetermined jack-up locations within the OWF using grab-mounted camera and relocating outside these areas. Placing of stone mats prior to jack-up in order to level the seabed. Bulk dredging of mud, silts, sand and pre broken/blasted bedrock rock, to the depth of -5.0m CD and transporting and dumping the excavated material out to sea. Removal of boulders up to 12 tonnes from predetermined locations within dredging area in Klaipeda Port and entrance. Water depths range approx 15 meters. Main contract for delivery and installation of filled geotextile bags serving as scour protection arround 80 WTG foundations. Maintenance dredging of area in front of two cooling outlets on a CHP plant, hereunder reclaimation of all material dredged. Delivery and placement of 3,8 km Ø800 PE100 pipe, hereunder trenching, ballasting, placing, testing, backfilling and survey & documentation. Dredging of Harbour basin and ferry berth. Dredging of approach channel to an oil pier. Included dredging, transportation to offshore dumping site and dumping through environmental silt curtain. Delivery and placement of 1,000m2 of geotextile with divers. Delivery, placement and levelling of 800m3 of stonebed with divers. Delivery and placement of 1,700m3 scour protection. Boulder removal in connection with major dredging works of the navigation channel to Mäntyluoto. Dredging, transportation and dumping offshore of sand from navigation channel and harbours. Dredging of approx. 13,000 m3 of sand in connection with establishment of new Marina, hereunder; transportation 12 Nm and pumping on-shore. Maintenance dredging of navigation channel to Nibe. Dredging of contaminated silt under floating drydock. Dredged behind siltcurtain and with enviromental grab - deposit on land for further treatment. Maintenance dredging of the Marina. Dredging from 3 places along the Schlien channel to Schleswig. Dredging work was retricted due to two low bridges. Maintenance dredging in Wismar hereunder dredging of underwater deposit areas for contaminated silt and leveling of seabed. Trenching, placing and backfilling for 3x132 kV, 3x50 kV and fibre optic cables for establishing new power supply to steel mill. Hereunder extra depth in fairway and floating channel for aproaching the shore. Maintenance dredging in Coal terminal in Tahkoluoto, Finland. Re-establishment of stone reef over Gas-pipe trench. Total amount approx 25,000 ton reclaimed at dumpsite. Delivery and placement of round stones (200/700mm diameter) from land to be placed around 18 foundations serving as collision protection. Delivery and placement of scour protection (filter & armour stones) of 21 foundations including surveys. Robin Rigg Offshore Wind Farm. Placing of scour protection and ballast on 90 foundations for the windmills. Trenching and backfilling for 350 m cable trench. Assistance with placement of pipe dia. 1000 mm. Trenching and backfilling with sand and dredged material. Recreation of stone reefs in different formations north of the island Læsø. Placing of erosion protection around 25 windmills and installation of 49 J-tubes. Repair of existing scour protection and placing of geotextile in ferry berth. With assistance of divers. Placing of 11 stone mattresses. Quantity: 1.000 tonnes 6-10 t stones, 500 m2 geo textile, 200 m2 pebble. Video diving inspection and documentation after placing of stones. Construction/ reinforcement of breakwater on the Düne Island. Marking of work area, repair of existing scour protection. Placing of new protection in the shape of 17 chain mattresses. Placing of submerged concrete. Dredging of polluted material, app. 3,000 m3, using a special environmental bucket. Pulling of cables from seabed up into the foundations. Backfilling of cable trenches. Seabed preparation for 48 windmills and 1 transformation station. Placing of erosion protection around 25 windmills and installation of 47 J-tubes. Quantity: 12,000 tonnes of stone & 1,800 tetra pods. Capital dredging of navigation channel. Capital dredging of harbour and navigation channel. Capital dredging of Peene Ship-yard. Driving of 92 sheet piles, 3 in the breakwater head. Capital and maintenance dredging of harbour. Maintenance dredging of harbour and navigation channel. Depth: ca. –5,7 and –6,1 m.
Dumping area close to harbour. Assisting in the salvaging of a fishing boat. Installation of 57 J-tubes at an offshore wind farm. The J-tubes are installed on mono piles with divers in waters with high current. Driving of 11 sheet piles. The piles were drived 7.1 m. from the dock with 8 m.
Laying and jetting to 1m below seabed of a 3,4 km long electricity cable from the mainland to the island Romsø. Water depths up to 16 m.
Assistance in connection with the inspection of the tunnel. Repair of pipeline, about 300 m. from the coast. Maintenance dredging of harbour basins. Maintenance dredging of 300 m. alongside the quay in Kulhavn. Dumped in Smaalandsfarvandet, distance ca. 6 sm. Maintenance dredging of naviga-tion channel. Depth: -4,0 to –5,0 m.
Dumped, distance 18,5 sm. using 2 barges. Dumped east of the dredging area. Delivery and driving of 8 Azobé sheet piles. Dredging and transportation of sand from the western to the eastern part of the harbour. Quantity: 10.000 m3 and 20.000 m3. Preparation of seabed for 18 navigation marks. Depth: -17 to –20 m.
Placing of gravel in breakwater. Depth: 0 to ca. –3- - 4 m.
Pile driving for jetty. Driving of 13 sheet piles, length. 8 m. and 3 sheet piles, length 9 m.
Digging and transportation of stones. Depth: 0 to –7,0 m.
The stones are unloaded direct upon the quay. Demolition of concrete jetty and removal of piles. Maintenance dredging of navigation channel and harbour. Dumped, distance 5 Nm. NNE from the harbour for beach replenishment. Planning of 5.000 m2 for concrete scour protection. Depths: 7,8 m. and 9,46 m.
After repair of scour protection supplementary placement of stone by divers. Depth: -7,5 to -8,0 m.
Backfilling of cables in 1 m. deep trenches. Length: 20 km. Dredging, levelling and scour protection for 72 windmills and 1 transformation-station. Dredging of sand and moraine clay. Depth: -7.0 to -13.5 m.
Size: coarse stone, Ø15-20 cm. Delivery and placing in breakwater. Dredging of 3,000 m3 sand in terminal. Renovation of bottom protection in western berth. Construction of new breakwater with excavated rock from dredging of Gothenburg’s harbour. Construction of a new scour protection in ferry berth. Coastal protection: beach replenishment of 7.000 m3. Demolition/excavation of old breakwater, dredging of stones and gravel. Laying of 1 PEH outlet pipe. Scour protection of Göta Älv. 5.500 t. stone, Ø10-500 mm. Dredging of 18.000 m3 sand (depth: –6,3 m.) Dumped at Vinga, distance 20 sm. Depth: –3,0 to -10,0 m.
Assisting with the removal of stones in navigation channel with diver. A total of 70 positions. Removal of existing breakwater – main bridge and jetty and construction of a new pear head and wooden jetty. A total of about 50 Greenheart piles and 30 m. wooden jetty. Crossing of district heating in Nokken/ Enghavebrygge. Dredging of trench 5 m. wide, 2½ m. deep, Laying of stone bed and backfilling of cable. Scour protection to ferry berth and dredging. Placing of 2.500 m2 gabions. Construction of a new breakwater head and extension of a breakwater. Driving of 55 stk. sheet piles Ø300 Greenheart. Dredging, transportation and installation of for stones used for ballast over Wesertunnel. Depth: -12 to –14 m.
Delivery, transport and placing of stones. Transport from Halmstad (S) and Glatved (DK) to Liseleje. Quantity: 13.821 t. Size: filter stone 50-300 mm., cover stone 50-100 mm. - ½-1½ t.
Dumped in dumping area, dis-tance 1500 m.
Placing and relocation of scour protection. Dredging of 16.000 m3 stones and mud. 8.400 m3 stones (0-600 mm.). 55 m. coast protection with Azobé sheet piles and laying of stones. Driving of 96 sheet piles at a length of 10 m. In connection with new jetty. Construction of 50 m. wave protection screen and pile edging of breakwater head. A total of 100 Greenhardt piles (30 cm. in diameter) for every ½ m. From this 16 slanted piles, and mounted stretch and build in stone filling. Removal of PEH pipeline. Diameter 560 mm. Removal of 2 PEH TN 16 wastewater pipelines. Dredging of harbour and land reclamation of sand. Quantity: 60,000 m3 sand and gravel land reclamation. 80,000 m3 dredged. Construction of 8 protection islands for the piers. Shipment and placement. Quantity: about 275,000 m3 of stone from Katholm. Yearly inspection of the KONTEK anode station at Stevns, and subsequent damage repair. Diving inspection of various vessels. Placement of 2.000 m3 scour protection, gabions (0,5 and 1,0 m.) and concreting. Dredging, placing and levelling of gravel bed. Placing of 55 km. of sea cable. Diving assistance in connection with renovation of sluice gates. Inspection, placing of shutters and underwater concreting. Levelling of stone beds for three temporary girders. Cleaning of the seaward working area after the completion of the Great Belt bridge link. At depths of up to 26 m.
Salvaging of items and video inspection. Various diving assistance with work for sluice. Inspection, assembling of beacon, concreting of cracks in concrete under water etc. Dredging of harbour and navigation channel. Material: hard moraine clay and sand stone. Removal of "Koen" and "Tyren", two permanent lighthouses outside of Korsør. Lifting of high spots in navigation channel with diver. Dredging of harbour and naviga-tion channel. Delivering and installation of 28 anodes at Smedekajen. Filling of holes for undermined piers and placing scour protection to 8 piers. Quantity and size: 79 m3 filling (0-16 mm. ), 3.870 m3 scour protection (0-400 mm). Digging of 12 km. cable from Drogden lighthouse. Removal of an offshore pipeline. PEL pipe, diameter 100 mm. Quantity: dredging of 25.000 m3 soft materials. Pumping of 90.000 m3 sand. Dredging to depth –7,5 m. and filling to depth +2,0 m.
Construction of stone beds incl. Levelling. Subsequently towage, surveying and placement of 2 concrete caissons. 15 m. in diameter and 15 m. tall. Pile driving of steel bunging in seabed of chalk. Length about 100 m.
Laying of 3 PEL pipes 160 mm. in diameter in a total length of 1.200 m.
Water intake to a marine bioresearch centre. Pile driving 120 m. iron bunging. Length 7-8 m. In connection with a new quay and breakwater enforcement. Pile driving of 2 new breakwater heads with wooden piles. Inspection adjacent quay along the ferry wharf prior to dredging. Towing of an old wooden vessel “Walther” from Neustadt, Germany to Grenaa, Denmark. Scour protection between quay and sheet piling. Laying of 320 concrete plates. Each weighing about 10 tonnes. Laying of about 150 gabions. Each weighing about 7 tonnes. Video inspection at Peberholm, the artificial island built as part of The Øresund link between Denmark and Sweden. Removal of stones prior to the dredging of the tunnel trace for The Øresund link. Seabed inspection in the casting yard for hardness of harbour sediments. Blasting and removal of a permanent lighthouse W26. Video inspection of the scour protection around the piers of the east bridge. Pile driving of 40 m. bunging of oak tree piles. Delivery and laying of PEH pipe. 110 mm. in diameter. Extending of a double concrete pipeline with a HOBAS polyester pipe diffuser. Length: 110 m. 1½ m. diameter at a depth of -10 m.
Pile driving of 40 Greenhardt piles for a jetty. Delivery and laying of 900 t. of stone, used as protection of sheet piles. Loading of 11.134 t. stone from the quay for use in an existing breakwater. Placing of 63.150 m3 of stone as scour protection in order to regulate an existing breakwater. The east bridge – construction of scour protection around 18 piers. Placing of about 250,000T. stone. Extension of existing concrete (1982) pipe in harbour basin. Assisting in the salvaging of 2.000 tonnes of Phosphates from a grounded cargo ship. Assistance with the laying of 8 Baltic-cables. Levelling of seabed. Laying of 100 titan nets 16,74 x 1 m., 54 x 0,40 m. in a half ellipse. 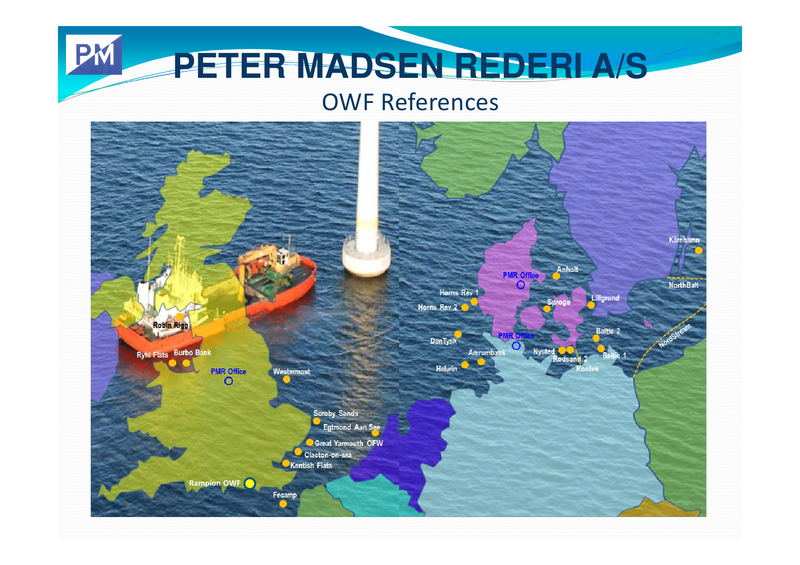 Depth: -10 to -16 m. Dredging of 1.760 m. trench and laying of 105 cables and coupling to the net. Backfilling of the trench and reestablishment of the seabed. Dredging of trench (105 m. by 20 m.) for a district-heating pipeline. Laying cables and backfilling under tight controls. Video inspection of seabed for breakwater trace. Breadth 50-70 m., length 5 km. Investigation of seabed with diver in navigation channel. Depth: -8 to -9 m.
Yearly video inspection of slipway. Dredging of trench from coast to coast. Max depth: -7 m. Dredging and backfilling of trenches for gas pipe. Total length: 870 m.
Laying of a cable in the shape of an ellipse. Construction of jetty in hard tropical tree. Pile driving of 72 piles, 250x250 mm. in diameter, length 6-10 m. Other timber work on jetty, a total of 95 m.
Construction of jetty in oak tree. Diving assistance divers with salvaging of seamarks. Laying of pipeline to the saltwater intake of the Kattegat saltwater Aquarium. Construction of an intake pipe and outflow pipe. PEH pipes 1.200 mm. and 1.000 mm. in diameter. Dredging of trench and laying and covering of pipes. Total length: 78 m.
Depth: 0 to -6 m.
Finishing breakwater construction at the north pier, Mukran. Transportation and placing of 6.280 t. of granite material, ½– 30 t. /piece. 8.216 t. of granite, 3–4 t. /piece. 1.343 pieces of reinforced concrete tetra pods 4 t. /piece. The west bridge – construction of scour protection around 62 piers. Placing of about 1,000,000T. stone. Delivery and placing of 805 t. of core material and 1.650 t. of 50-800 mm. stone from the sea. Transportation of 19.767 t. of stone and placing in pier construction. Construction of 2 breakwaters, 22 m. and 66 m.
Delivery and construction of 11.500 m2 of geotextile, 5.200 m2 geo grid, 4.300 m3 sand. Partly in sandbags in 2 layers 2.300 m3 and partly between sandbags 2.000 m3. Further 2.000 m3 gravel and stone for covering of breakwater. Dredging of trench, laying and covering of pipes under Kalvebodløbet and Sorterenden. 2 connection pipes between Östrand and Vivsta Varv. 630 mm. x 3.100 m.
710 mm. x 3.100 m.
Length incl. diffuser 555 m.
Depth: -1 to –9.7 m.
Construction of breakwater for a temporary working harbour. Dredging for cable and covering of cable laid by ”PETER FABER”. Length: 847 m. and 749 m.
Laying and high pressure jetting of cable ½ m. into sand bottom by shore. Digging of 3 cables. 108x190 mm. Diameter. Total length incl. diffuser: 597 m.
Piling driving of 314 oak piles, 250-300 mm. In diameter, length 8-10 m.
Fixing of timberwork for the construction of a new yachting harbour. Driving of 110 piles, 250 mm. In diameter. Length: 7-8 m. prior to the construction of a bridge. Laying of high voltage cable between Læsø and Søby. Pulling of 100 piles along with the removal of a bridge deck. Replacing explosion damaged lighthouses in the channel of “Svitringen”. Pulling of 454 sheet piles. Length: 10 m. long. Pulling and replacing of 230 mooring posts. Laying of cable. 48,4 mm. in diameter. Diffuser 500 and 800 mm. In diameter. Total length: 30.5 m.
Moving of PEH pipeline. 315 mm. in Diameter. Depth: -3.5 to -9 m.
Pipeline diameter 400 mm. Length: 767,5 m.
Depth: 0 to -11,4 m.
Concrete encased steel gas pipeline. Depth: -2 to -18 m.
Salvaging of a fishing vessel. Assisting with the installation of a water intake to a power station. Blasting and excavation of the lower part of a tunnel construction. Pulling of 489 concrete piles along with 635 steel and wooden piles. Depth: -2,0 m.